Are the affordable Onkyo ES-HF300 hi-fi headphones a rival for Beats Solo? The Onkyo ES HF300 are the brand's first headphones, but without an inline remote or control gimmicks, are they worth a listen? The headphone market market hit a high of £226 million in the UK last year and 2013 is the year when hi-fi companies are really taking things seriously and the arrival of the the Onkyo ES-HF300 is clear proof of that. They're the first ever pair of headphones from the Japanese company. 2013 sees hi-fi rivals such as the Onkyo ES-HF300 and KEF M500 stepping up to the challenge of fighting established products like the Beats Solo and Beats Exectuive and models from Sennheiser and Bose. The first thing that strikes you is the slick design with the largely aluminium alloy build making for a lightweight, rugged feel when using these headphones on the go. Similarly, the intriguing transparent cable is detachable and can be replaced if you're rough with it, though the end of the cable is a solid right angled connector that beats many rivals for tank-style build. The headband feels cheap and the ear cushions aren't as luxurious as rivals but, at the same time, these headphones are £100 less than many rival products. Both cups fold. The lightweight build means these aren't heavy when worn around your neck and the cable is the perfect pocket to ear length. Sadly there's no inline control for iPhone 5 or Android users, or a mic. 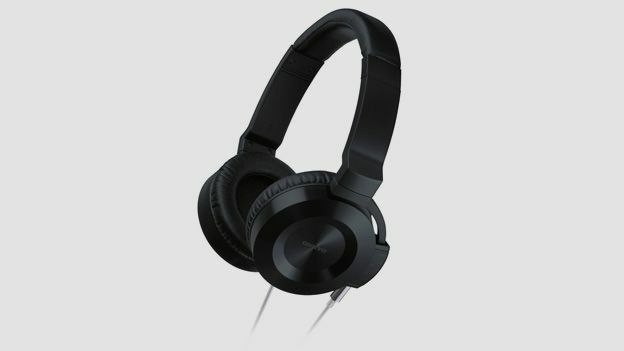 Onkyo argues that this is all about the purity of the signal through the cable, which is itself a premium grade upgrade to the cheaper (£149) FC300 model of the headphones. You're paying a £30 premium for these headphones based upon the cable - the former FC300 cable is flat and doesn't deliver the same quality sound. The HF300s can't reach the sonic highs of headphones at the £269 price bracket, namely the Philips Fidelio X1s and Sennheiser Momentums. However, the sound is impressive for the money. There's good bass, little sound leakage and surprising detail for the price point. Talk Tonight by Oasis gives a detailed performance, Paramore's Misery Business let's bass guitar lead the show too much, but Ho Hey by The Lumineers delivers punch and detail in equal measure. Girl, You Have No Faith In Medicine by The White Stripes shows that raw rock works well. Fussy, intricate guitar solos and layered rock fares less well, but still gets the message across with energy. The sound stage is broad and the cups fit the biggest of ears. As a result, these make a great pair of cans for movie use on a tablet or PS Vita - dialogue is clear and action scenes have plenty of bass. There's a bucket of bass here if you're after something like Beats cans and, against the £169 Beats By Dre Solos, they beat them hands down for detail. They may not have the same build quality, but they sound better and are just as tough. £100 more catapults you into the premium end of urban headphones for your commute but, for the money, these are a bargain. Make no mistake, these are sonically superior to similarly priced wireless rivals. If you're all about the sound and can't stretch to the higher price bracket, these are great cans.